There is no culture without gastronomy! But here is the mistake! Gastronomy fully takes part of a cultural journey! It’s a real rich and unmissable experience for a complete trip! Of course the main goal of a gastronomic tour is making you tasting the best, traditional and local products and specialties of the country, but it also means showing you a cultural area of the city and the best places and locations to discover this culture, some typical and hidden sites you wouldn’t have thought about. A gastronomic tour is also learning more about the culture, and your passionate guide will follow you throughout the itinerary. It’s a real adventure unlike a lot of people can think! More than just tasting in our Panama Gastronomy experience, you will learn about how traditional dishes and local products as chocolate, coffee or honey are made and their whole process, and you will even have the possibility to visit some factories! You could admire the view on the extensive skyline of Panama City while trying a ceviche at the Mercado de mariscos or the famous “raspado” on the Cinta Costera. To end your culinary tour in the capital you may get on a guided tour through the microbrewery and taste some of their beer specialties. Also if time permits you could visit a Rum factory to try the artisanal Panamanian rum. One day or one week, a culinary journey can be fascinating and so rewarding! Out of the city, in the Azuero Peninsula you could so visit a local Rum factory, learning about the complete process of rum production – from harvesting the sugarcane until tasting the golden liquid. Then enjoy discovering the manufacturing processes of the traditional products of the Herrera Province: sugarcane, salt, clay and bread. In addition, you will have the chance to lodge in an eco coffee farm in the Boquete province. The day after you will visit the coffee plantations and learn about the complete process of making coffee before tasting it at the end of the tour while enjoying an extensive view on the surrounding highlands. Once the coffee tour ended, you will go on a local honey plant located on a small farm in the highlands of Boquete to end with a world-class honey tasting. And what’s better than ending by a tour in the jungle to visit the Embera community and trying their fresh fish lunch? 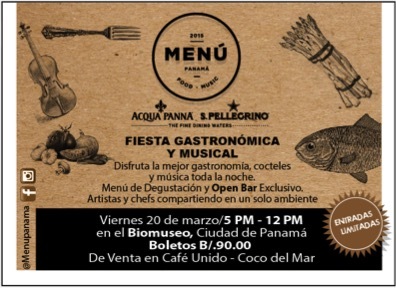 So book a culinary tour now with EcoCircuitos to get into the Panamanian culture!